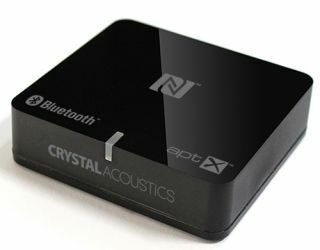 Crystal Acoustics launches BluDAC Bluetooth receiver and DAC for £60 | What Hi-Fi? Now this looks like a bit of a bargain, on paper at least. The Crystal Acoustics BluDAC combines a Bluetooth receiver and digital-to-analogue converter in a compact box for £60 – undercutting Arcam's rBlink by £100. Plug it into your existing hi-fi and you can stream music from your smartphone or tablet via aptX Bluetooth to your main audio system. Connection is made using either stereo analogue or optical digital cables. Inside the compact casework (7.5x6.5x2cm) is a high-quality Wolfson DAC. The BluDAC can remember up to eight paired devices, and has a maximum range of 10 metres. It goes on sale this month for £60 and is sold directly from the Crystal Acoustics website.